Some artists at Sunday's "A Concert for Charlottesville" took a knee in solidarity with NFL players who protested during the national anthem in defiance of President Trump, who said that players who kneel during the "The Star-Spangled Banner" should be fired. 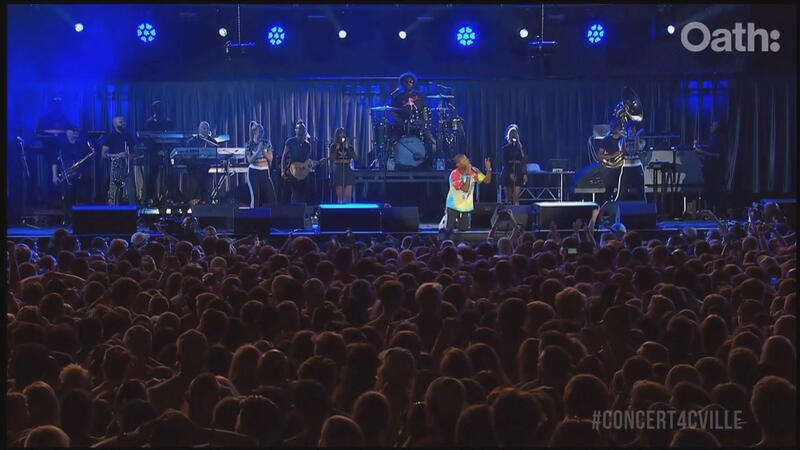 Pharrell Williams got down on both knees during the concert, a show that aimed to promote "healing, unity and justice" following a white supremacist rally in Charlottesville in August. One woman, Heather Heyer, was killed and 20 people were injured after a man drove a car into a group of counter-protesters. "Can't nobody tell me what to do," said Williams. "If I wanna get on my knees right now for the people in my city, for the people in my state, that's what that flag is for." Stevie Wonder also took two knees. He said, "I've seen people killing people in churches, mosques, synagogues, and temples. I've seen hate marching down the street disguised as a cry for equality ... And now, I take a knee for America -- yes I do -- and two knees in prayer for our world. Amen." Justin Timberlake also knelt on stage, following the lead of NFL free agent Colin Kaepernick. Kaepernick, the former San Francisco 49ers quarterback who remains unsigned, started the kneeling movement in 2016 to protest racial injustice in America. The free show Sunday, which gave priority tickets to Charlottesville residents, University of Virginia students, faculty and staff and residents of the adjacent counties, drew thousands of concertgoers. Dave Matthews, whose band got its start in Charlottesville, hosted the concert, and introduced Susan Bro, the mother of Heather Heyer. She said to the crowd that the concert was a "powerful and peaceful" way to unite against hate, reports the AP. Other performers included Ariana Grande, Chris Stapleton, Brittany Howard, Cage the Elephant and surprise guests Chris Martin and Jonny Buckland of Coldplay.